Pipes are unique spiral-welded, pressure vessel class steel pipe with outside special zinc coating and inside special thermoplastic coating. Its connection is also with arrangement of Quick Coupling. These pipes are stronger, lighter, lower flow resistance, better anti-corrosion properties than stainless steel and provides better cost effectiveness. We also provide special solutions tailored to your needs. Low flow resistance due to Thermoplastic Coating from inside, the surface becomes smooth and offer lower flow restistance. Due to better flow we can choose pipe of smaller diameter. Larger inner diameter for the same outer diameter as walls are thin. The pipes are lightweight and strong due to high quality steel and the spiral welding technique. Reduce energy consumption by up to 50%, as we can use pumps with lower power ratings. No corrosion, minimal wear – Better Than Stainless Steel. 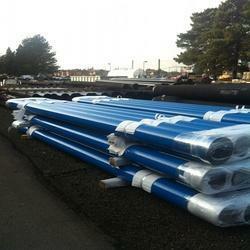 Pipes can be supplied with different types of corrosion protection. Coated pipes are ideal in environment of acidic water, aggressive chemicals, slurry, extremely abrasive media. It meets the requirements of the marine environment’s toughest corrosivity classification, C5-M. Pipes treated on the outside gives an even more durable surface that better tolerates mechanical wear. Ideal for pipes that are to be dismantled/reassembled due to a very robust surface coating. Installation very easy. No welding. No special tools. No time-consuming training. Assembly faster as done entirely without hot work. Pipes have quick couplings. They can be easily dismantled and re-used. Pipes are lower in cost in comparison to Stainless Steel. Lower CO2 emissions due to special manufacturing process. Lower power consumption during construction, as no welding.